What Will Your Plumber Do During A Drain Replacement Project? If the plumber determines the problem is in the main sewer line, they need to isolate the exact location of the clog. Most modern plumbers will use sewer video cameras for this purpose. They’ll introduce the camera to the pipeline through an access point and direct it through the system. The camera will transmit a live feed to a display above ground so the plumbers can assess it and determine the source of the problem and the general condition of the pipeline. Once the plumbers have determined the location of the problem, they’ll begin the repair work. Your plumbers will shut down the sewer system and drain it completely before they start the replacement process. They’ll dig two small trenches on either side of the damaged area and cut into the pipeline. This would act as access point to insert a steel cable with a metal head at one end. Once the steel cable with a metal head is in place, the plumbers will attach a new pipe to the head and pull the cable back. The metal head will split the existing pipeline and replace it with a new drain pipe. Expert plumbers at Dr. 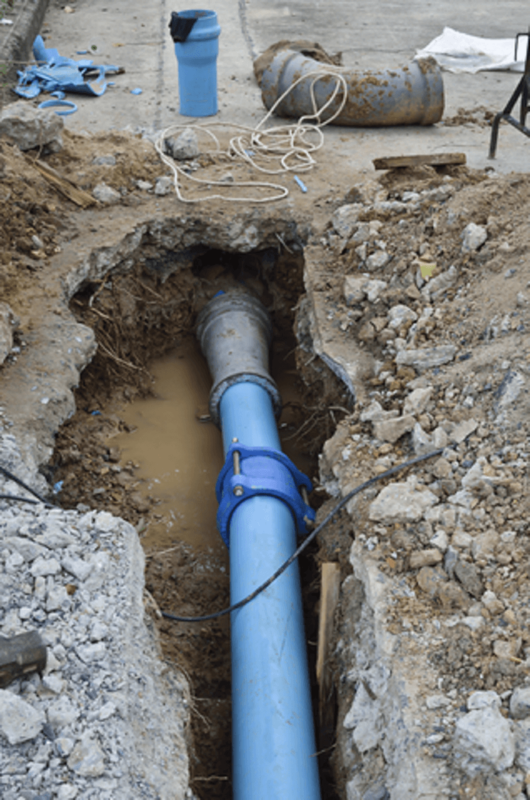 Pipe Drain and Plumbing Services will be happy to answer any questions about the drain replacement process so give them a call at 416 663 4777 or contact them through this form today!